So it begins. I’m participating in Comic Book Girl 19’s Dune Club, where every week participants are to read the pages assigned, and discuss them every Sunday until we’ve completed the novel. Once this is done, I plan on reviewing the Dune movie and mini-series. I’ll be keeping my notes and thoughts on each section of the novel from here on, one post per week on each section. It will be divided by thoughts I had on the section prior to the Twitch stream discussion, and thoughts I have after the Twitch stream discussion. 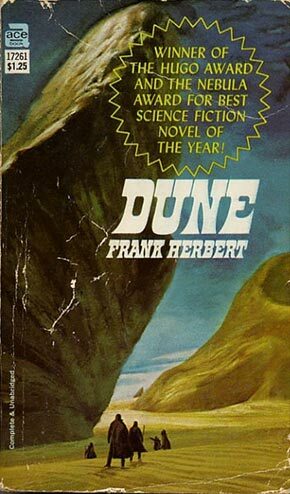 For the record, for the Dune Club, we are using the mass market paperback edition (not the one with the image shown above, even if the artwork on it is awesome). Berkley Publishing Group, published by Penguin Group, Penguin Books Ltd. An Ace book, premium edition December 2010. Notes before the Twitch stream. So here’s the first really interesting section I noticed. It is mentioned, especially when referencing the Appendix, that men were once ruled by machines, or ruled by machines controlled by programmers. Startling prediction well ahead of its time, don’t you think? Especially considering that this was originally published in 1965. The history here is that there was eventually a revolt, but rather than turning into a Terminator/Skynet scenario, those who revolted against the machines and their programmers won out, and they’ve been outlawed ever since. With this turn of events and this new law, schools were made to train and develop human minds so they can think fast like computers, store memories about as well as computers. So that humans will never be forced to rely on such machines ever again. In the Dune universe, there are 3 groups who have these computer-like minds, the Bene Gesserit (of which the Reverend Mother and Paul’s mother belong to), the Spacing Guild, and to a much greater extent the Mentats. The Spacing Guild specialize in mathematical thinking, which makes sense considering they specialize in interstellar travel. The Bene Gesserit specialize in politics, always trying to influence the most powerful to get things done their way, with their goal to eventually give birth to and control the supreme being, the supreme ruler, the Kwisatz Haderach. The Mentats tend to be more along the lines of logical thinking. Because while computers are technically capable of doing anything and holding an incredible amount of information, humans are more limited. They can only store so much and think so quickly. So while schools exist in this universe to push the human mind further than it’s capable of in our present day real world, they specialize in how the mind is pushed, and into which area. Mathematics, politics, logic, etc. I fear this could become a reality, as I’m sure Frank Herbert did as well. He did spend 4 years researching for and writing this novel after all, without the aid of computers I might add. Computers are taking over everything for us. Lines of communication, forms of entertainment, even for placing orders and making meals at fast food restaurants. And don’t even get me started on the sexbots. The reliance on machines has been a concern of mine for years now, probably for a decade. And seeing how much more reliant we get on them, automation, disregarding human skill as it’s outdated and less efficient compared to that of machines, etc. Such worries aren’t as new as you might think. Frank Herbert had to get this idea from somewhere, and evidence of such paranoia can be seen as early as the 1930s. However, keep in mind the revolt against the machines in this novel strictly relates to machines made in the likeness of a man’s mind. Artificial intelligence, machines meant to act as people. How far it went with this is only implied (good to keep it vague). Like Replicants in Blade Runner. I will come back to this concept of the dangers of AI later. It is brought up again within this section of reading. It is here I wonder, did Frank Herbert underestimate how powerful machines would get, or is this an overestimation of the humans? Or have human minds, in general, developed/evolved quite well on average in this book’s universe, indicating that we are destined to grow more intelligent, much like how we have grown more intelligent compared to our cavemen ancestors? I’m currently thinking the latter, since humanity has come a long way over each millennium. Relying on computers could cause us to slow down along that evolutionary path. We only evolve for the sake of survival. If we become dependent on something else for the sake of our own survival, that something else is what will evolve instead, not us. And if that something else should cease to be reliable, that would put us in grave danger. This is why I don’t believe in becoming too dependent on machines, if even dependent at all. Consequences will befall us for doing so, sooner or later, one way or another. I believe this jihad against machines, as indicated in the novel, didn’t just happen against machines made in the likeness of the human mind, because the above quote indicates that other sorts of machines were also outlawed as a result. But the “human likeness” machines are likely the spark that lit the fuse to set off the revolt. Ah yes, power and wealth in politics. The more power and wealth one has, buying influence and votes to maintain said power and wealth, the more others will want a piece of it, and thus wish to side with the politician to share in those profits, by following the politician’s orders. Though it can also be argued that it’s a corporation that holds the power. Perhaps both, as the line becomes muddled at times when corporations and politicians have always been intertwined throughout history. Ah, the concept of child-raising. How much should a parent protect their child before it becomes detrimental towards the child’s strength and independence? How little protection before the child is put in too much danger? Sometimes children must face terrible pain in order to grow and mature. Just the facts of life. It is also brought up soon after this quote about the Missionaria Protectiva. This is an arm of the Bene Gesserit used to sow infectious superstitions on primitive worlds. This has been done on the planet Arrakis (aka Dune). This is going beyond the first 59 pages, but I do have to raise this subject up. Are the Bene Gesserit thus responsible for the prophecies the Fremen carry regarding Muad’Dib, of Paul Atreides being their savior and such, much less the other things around that? Something to keep in mind for future reading sections. Because if that is the case, these superstitions ended up being turned towards the Atreides’ advantage, which I don’t believe was the intention of the Bene Gesserit. The meaning here being that one should always stand defiant against an enemy, or even against the forces of nature. Sometimes one must bend to their will in order to gain strength to fight against them (and possibly win) another day. I’ve seen this as the core philosophy in that Martin Scorsese film Silence. “[…] a ruler must learn to persuade and not to compel.” – Paul Atreides, quoting Reverend Mother. “‘A process cannot be understood by stopping it. Understanding must move with the flow of the process, must join it and flow with it. '” – Paul Atreides, quoting the First Law of Mentat. Notes after the Twitch stream. Kwizatch Haderach: the shortening of the way. It is implied that the Baron Harkonnen’s mind is more advanced than that of the computers in the past destroyed by the Butlerian Jihad (page 28). I believe this indicates that many non-Mentat individuals have minds as capable as the Baron’s. Do you believe this indicates that human minds have evolved to be better than computers of the past, such as how we’ve become more intelligent than our caveman ancestors; or do they overestimate their mental capabilities for the sake of giving the impression that computers are outdated and thus not even worth attempting to bring back? Butlerian Jihad was sparked because a robot programmed by a jealous doctor killed a woman’s baby as it was being born.